The player must mark and lift their ball and, in the unlikely event that a member of the Committee is on hand, request that the hole (and in the right hand photo, the hole liner) is repaired. Otherwise, the player may repair the damage as best they can, without penalty. The ball must then be replaced on the lip and putted out. Decision 16-1a/6 clarifies the procedure for a player when a hole is damaged. If a player repairs a materially damaged hole when a member of the Committee is readily available, he incurs a penalty for a breach of Rule 16-1a. Incidentally, the speed at which the ball must have been travelling to make the damage shown in the right-hand photo, leads me to the conclusion that there is no way that it would have finished at rest in the hole. This assumes that the photo is genuine; it has been doing the rounds and I suspect that the situation may have been manufactured to give us Rules experts something to talk about! He is correct, a player may do nothing in front of their ball that may be construed as changing their line of play for the better, potentially giving them an advantage, Rule 13-2 and Decision 13-2/0.5. I have almost finished updating my eBook and eDocuments with the amendments to the Rules and Decisions that are effective from 1st January, 2016. Anyone who has purchased from me since 1st April will automatically get the updated files sent to them, free of charge. The .mobi file for the '999 Questions' eBook (for eReaders, smart phones and tablets) may take a little longer, as I am dependent on an outside service for this. As soon as I do have it, I will update the file at Amazon for those of you that prefer a paperback version. Please watch my blog site for details. Unfortunately, my 'Search This Blog' widget (top right corner) has not been working for the past few days. However, if you use Google and enter a Rules search term followed by Barry Rhodes you can achieve similar resul (e.g. "Embedded ball Barry Rhodes"). 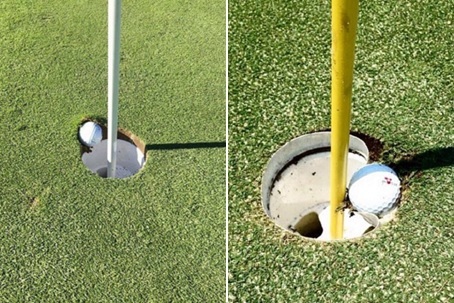 In the left photo, would the call be considered to be "within the circumference of the hole"? Definitely not. Part of the ball is outside the circumference of the hole, so it is on the lip. Since the damage to the hole is a ball mark, the player may repair it. It would be good if you were to clarify that the plastic ring inside the hole was illegal as it reduces the diameter of the hole to less than 4 1/4 inches. In the right photo the ball is resting against the flagstick although it may not be in direct contact because of the hole liner. Does the player have the right to remove the flagstick to see whether the ball subsequently falls into the hole as per rule 17-4 ? Yes! This is obviously the case in the photo on the left. As I mentioned in the blog, I suspect that this photo was contrived. I am not aware that anyone has claimed otherwise since it first appeared. Yes, of course, Rule 17-4 still applies. However, the player must not use the flagstick to move the embedded ball, e.g. by wiggling it against the ball, or pushing it with the point. I am happy to say that I have never seen liners used at any course I have played. They seem like an opportunity for something else to go wrong. To my way of thinking, the picture on the right should result in the ball being holed as the ball is within the diameter of the hole and resting against the flagstick. Of course the liner is stopping it from dropping in. Can the liner be regarded as a "movable obstruction" and either removed (like a flagstick) to allow the ball to drop into the hole OR relief taken whereby the ball is placed directly below the obstruction ? Bunker liners (this refers to my previous week's blog) are used in many countries to avoid "something else going wrong" because they improve drainage and control erosion of the sand. It is uncommon for them to be visible, so perhaps you have played from bunkers that were lined without realising it. A ball resting against a flagstick is not holed. The flagstick has to be removed and the ball must fall below the circumference of the hole and be at rest. If the player in the (contrived?) photo removed the flagstick and the ball fell into the hole (extremely unlikely in my view), they would have holed out. Of course, the player may not use the flagstick to dislodge the ball in any way (e.g. by waggling it around or pushing the ball with the point), they must just remove it. Rule 17-4 specifically deals with 'Ball Resting Against a Flagstick'. There is no such Rule for hole liners! In any case, hole liners are not intended to be 'easily movable, which is a requirement for movable obstructions. I can assure you that the ruling I explained in my blog is correct; there are no other possibilities. Sorry to keep on with this one but I am probably as pedantic as you. In the comments regarding your blog of 30 April, 2009 you refer to Decision 17/8 in reply to a comment made on 13 May 2011. This decision seems to regard the hole liner as an outside agency in which case Rule 19-1a would apply and the ball should be placed directly under the spot where it came to rest. When you reply, I suspect we will move onto a discussion about "not nearer the hole", but I will wait for your comment about "outside agency" first. Rule 19-1b. If the hole-liner was not moving, the ball must be played as it lies - Rule 19-1..
Rule 19-1a is not relevant because, as shown in the photo, the ball has not come to rest in or on any moving or animate outside agency. If you cannot accept my ruling I suggest that you address your questions to some other Rules expert. the piece of plastic that appears to be supporting the ball isn't part of the hole liner. It's a piece of kit that can be used to protect the lip of a hole when working on a green, rolling, mowing, etc.and then removed, it should not be there. No self respecting Greenskeeper would leave one in a hole so I think you are quite right about the picture being set up to torment rules experts. Of course you are correct. But if we assume that the 'hole lip protector' had been left there by greenkeeping staff in error, I stand by my ruling!